Konica Minolta has launched the AccurioWide 160 and 200 Hybrid UV Wide Format Printer. Both printers are designed for commercial and franchise printing, with their hybrid technology platform. These printers both use UV (ultraviolet) ink technology, which saves on ink by using more color pigment per drop. The printer has a print resolution up to 1440×720 dpi (dots per inch), which results in beautiful print quality. These printers also use a mix between LED curing lamps and air cooled UV light that speeds up drying times. The AccurioWide 200 is the higher-end version of the two. It has a larger print width and faster print speeds compared to the AccurioWide 160. The AccurioPro WideDirector is the software that will help run the AccurioWide printers. The software is all in one, which means it allows the user to use automated job layout, manage colors, and much more within the software. This software will also work with the Konica Minolta FD-9 spectrophotometer, along with support coming for the Konica Minolta FD-5 and FD-7 hand held spectrophotometer. 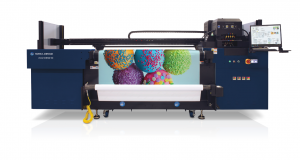 The AccurioWide 160 was on display at Print 18 from September 30 – October 2 in Chicago, Illinois and the AccurioWide 200 was on display and demonstrated for the first time at Specialty Graphic Imaging Association (SGIA) Expo in Las Vegas, Nevada from October 18 – October20.